After falling behind by double-digits in the first half, the Lakers were making their run to open the second half. LeBron James was furiously attacking the defense and getting buckets in the paint. 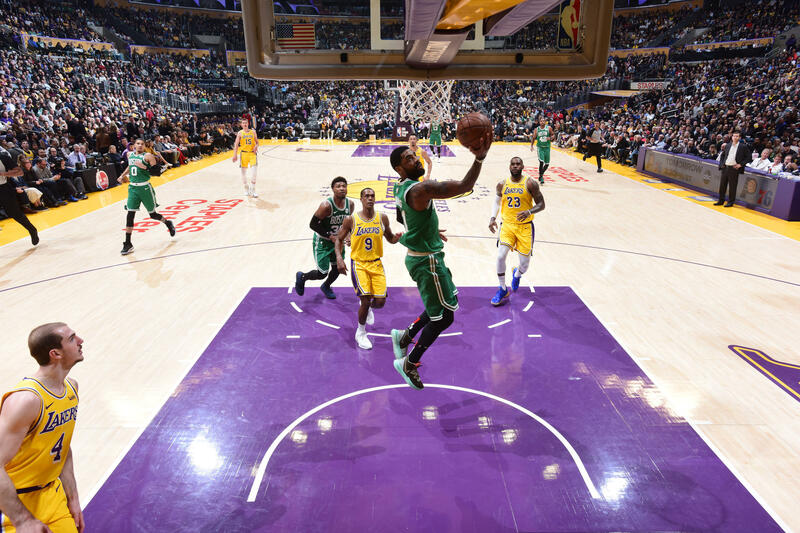 The Lakers cut the deficit down to just six points and had stolen momentum from the Celtics. Irving stopped the bleeding momentarily when he had a nice drive and dish to Marcus Smart for a three-pointer. The Lakers continued to roll. So Irving didn’t stop. He nailed a tough contested jumper to keep the Celtics ahead by seven. In the following possession, Smart got the steal and found Irving leading the pack. Irving got the ball and immediately pulled off a behind-the-back move into a nifty reverse layup, erasing Alex Caruso from the picture. LeBron James went to the bench briefly and that was Irving’s cue to lead the Celtics on a game-clinching run. He drove to the hoop for a high-looper. He followed it up with a pull-up three-pointer with the defense in his face. That put the Celtics up by double-digits once again and the Lakers didn’t have the firepower to keep up with a rejuvenated Boston squad. Irving showed what leadership was all about in this game. When the Celtics had their backs against the wall, Irving came through and carried his team to the win. His baskets came at the right time, and had the right amount of flair to steal momentum back from LeBron and the Lakers. Irving finished with 30 points and five assists to lead Boston. This performance was coming off the reports that Irving led a team-building cross-country flight before their road trip in California. According to a report by NBC Sports’ Chris Forsberg, it was Irving that initiated the interaction with his coach and teammates. “Kyrie was instrumental because he was the one that initiated everything as far as being like, ‘Hey, let’s have conversations, let’s play cards, let’s do this, let’s do that’ on this plane ride,” Horford told NBC Sports. The bonding that happened during, what media is now calling “The Flight”, may have changed the course of the Celtics’ season. They boarded the plane losers of five of their last six games. When they landed, they rattled off three straight wins including routs of the defending champion and their rivals in LA. The Celtics might be peaking at the right time. Before the marquee game against the Celtics, the Lakers received a huge blow. First, the team confirmed that Brandon Ingram will miss the remainder of the season due to Deep Venous Thrombosis. This was after further tests of the sore shoulder that’s kept Ingram out for the past two games. OFFICIAL: Brandon Ingram, who has missed two games due to a sore right shoulder, underwent further testing yesterday which revealed a Deep Venous Thrombosis (DVT) in his arm. After the announcement of Ingram’s shut down, ESPN reporter Ohm Youngmisuk reported that the Lakers are also shutting down Lonzo Ball. The point guard injured his ankle last January 19 and hasn’t played since. Lonzo Ball (ankle) has been shut down for the season after latest medical evaluation, source confirmed. The Lakers’ Playoff hopes have basically evaporated after losing seven of their last nine games. Whatever hopes the Lakers faithful still had might now be totally gone after these shut downs. As big as those two impact the Lakers, the Timberwolves suffered an even bigger loss today. Late in the fourth quarter of their game against the Wizards, they lost Karl-Anthony Towns to a scary knee injury. Towns was making a move to the hoop when he planted his left leg and then started limping away from the play. He hobbled to the bench but was able to put some weight on his leg. Based on the video, it could be clearly seen that Towns said the word “popped”. Whether he said that it did or didn’t hasn’t been confirmed yet. The Timberwolves were able to hold off the Wizards for the win in OT. There is no additional reports yet on Towns’ injury. But for now, everyone is hoping that it isn’t anything serious. Last season, the Bucks finished with 44 wins, only good for seventh in the East. This year, it’s been a totally different story. Milwaukee has been the most dominant team in the league. Even more dominant than the Warriors. They’re leading the league in Net Rating at 9.0, nearly four points higher than the second-place Warriors. They’re third in Offensive Rating (113.5 per 100 possessions) but tops in Defensive Rating (104.4 per 100 possessions). Because of that, Milwaukee is the first team to 50 wins by a wide margin. They beat the Hornets for the big five-oh. The Warriors need five more wins to get to 50. The Raptors, second in the East need three more wins. The Bucks have already clinched a Playoff spot in the East and are tracking to win 63 games. If that happens, that would tie highest win total in franchise history.